Living in this land of duality, we are continually harboring arbitrary either/or concepts. Some of these, we may not even be aware of. One of the most common ones, which causes one of our greatest limitations, is an attitude we hold about winning or losing. In this way of looking at things, being a winner means being ruthless. We must be selfish, trampling and triumphing over others and belittling them. This leaves no room for being kind, considerate or sympathetic. Should such emotions be allowed, one would fear turning into a loser. Being a loser, then, means to be unselfish. We are then self-sacrificing, kind, good and considerate people. Some of us will adopt one alternative, and some the other. But everyone fears the consequences of being the opposite of what they are. Neither of these two choices is good. Neither is better or worse. Both have the same misconceptions built into them. And both lead to nothing but loneliness, resentment, self-pity, self-contempt and frustration. No bueno. When two people come together in a relationship from these opposite teams, it will be fraught with great friction that will lead to the point of hopelessness. The winner will be fearing impulses of genuine affection as much as they fear weakness and any inner desire for dependency. For the loser, their concept of goodness is equated with total approval from others. This means they can’t stand any form of criticism, whether it’s justified or not. Both sides are basically resenting in the other what they are fearing and fighting in themselves, which is their hidden tendency to be like the opposite choice. Oh brother. Most of us are sitting on something like this, deep inside us, to some extent. For some, it’s like the water they swim in. For others, it just shows up here or there. The vague underlying sentiment is: “If I can’t have what I want, I lose,” or “In order to not lose, I must be tough and not care about anyone but me.” Everyone’s afraid of losing, although the latter may go ahead and punt on all hope for human warmth, appreciation and love. That’s a mighty high price to pay, even if it worked as a strategy for winning. Even then, such a “winner” can never let their guard down, relax and let go. Through their sacrifice, by crippling their very being, such a person thinks they stand a chance to win. When this doesn’t lead down a road to victory, doubt sets in. Negativity piles up. Inner strength plummets. One ends up more inadequate than ever. We can totter on a fine line between assuming, anticipating and therefore fighting against losing—and resigning ourselves to it. We’re on that line if we feel our choice is between being the cruel one or risking being the poor stupid one. Or maybe we resign ourselves to being the latter, taking pride in our decency. In this case, we don’t dare defy the rules that seem to say goodness equals deprivation. Whichever horse we pick, it’s inevitable: guilt and uncertainty will abound. Both sides tug on the world at large. Winners make big demands on the self, which are impossible to meet and end up being destructive for everyone involved. Losers demand the world reward them for the way they have sacrificed happiness. They don’t go after their own fulfillment so others are supposed to rise to fill this gap. You know, as a reward for being so amazingly good. But no good can ever come of this approach. This win-or-lose concept is just so tragically wrong. On so many levels. And so unnecessary. The tragedy here is that what we deeply believe to be true ends up appearing to be true. We make it so. That’s how our images, or hidden beliefs, always go—they confirm their own wrong conclusion. So we will always end up on the losing end of this stick. Just believing that these are the only two alternatives is wrong and limiting. Truth is, we can assert our rights and reach for what we want without being cruel or depriving anyone else of anything. Let’s go one further—it’s necessarythat we reach for what we want. But a limited wrong conclusion can make us feel guilty for going after what we wish. And the subtle No-current built into this guilt will act as a barricade in our way. By the same token, we can, from time to time, give up our own immediate advantage for someone we love, and that doesn’t mean we are forfeiting all our rights and advantages forever. We can say Yes to being happy ourselves, and that doesn’t mean we have to say No to considering others. The more convinced we are of this on all levels, the fewer conflicts we will have between what’s an advantage to us versus someone else. In this way, we embrace reality and widen our horizons. And that’s how we break through the barriers presenting reality as being harder and harsher than it really is. We see that in the mutually exclusive dilemma of win-or-lose, neither option is preferred. There can be no right decision. We can liberate ourselves from the guilt and frustration of trying to make this work—to get others to give us what they can never provide. No more needing to belittle or triumph. This truth opens up a vast space of peace and certainty inside us. As we search for where this conflict lives inside ourselves, it’s important to remember that our tendency to escape reality is often not based on a fear of facing aspects that are unpleasant. Just as often, on a slightly deeper level, we’ll discover our fear of happiness, of being fulfilled and living a full life. No doubt, if we want to be all we can be, to live our best life, we have to find a way to tap into the divine strength—with all its truth and love—that’s deep in our psyche. Wow, that can just seem so impossible to do. And dangerous. We’ll have to go into the dark parts of ourselves. Wouldn’t it be easier to just pretend that life is dismal and hopeless? Can’t we hang on to this idea that someone else is going to save us? To take care of us? We can flatter ourselves that such an approach is “just being realistic.” After all, isn’t it more realistic to accept suffering and pain than to think we can live constructive lives and become happy? Or so this thinking goes. What we are really afraid to face is the fact that life could be meaningful and beautiful. Because accepting this requires that we have the courage to look for the truth within ourselves. When we peel away faulty either/or concepts, fear will give way to truth. We will expand. There’s no limit to how far we can go in expressing beauty, wisdom, productivity—for ourselves and for others. If we’re ready for bliss, bliss is ready for us. This creative process, like any other, requires a balance between the self and universal powers. Creation of any kind, in fact, relies on the presence of universal powers. So this is confusing—which is it? Nothing of value happens without these creative powers. Or we are masters of our own fate and we create our lives according to our personal wishes. Another either/or nut to crack. Which is better? Disregard these creative powers and trust the outer mind and will, which admittedly doesn’t ever get us very far. Or don’t trust ourselves at all and put all our faith in an outer deity that we pray-to-God won’t let us down. And yet it does. All misunderstandings which are exclusive and limiting will lead us to disappointing alternatives. In this case, they both leave us not trusting God or the self. This happens because the balance between these two—the self-directing mind and universal creative powers—goes haywire the minute we feel forced to choose between them. To find the proper balance, we need to understand the function of the two sides. The job of the self is to want whatever is right for us—whatever we yearn for. If we are happy, this will allow for an inner manifestation of the divine, which must do the same for everyone around us. We have a positive affect on others when we live up to our inherent potential. The more intense the contact with ourselves, the greater this effect will be. But we have to be connecting with something that will really make us happy, not some surface superficial desire. It can’t be something we want because that would be the obvious aim. We can’t have our desire be foggy and half-formulated. We can’t be simultaneously sitting on a feeling that to be happy is to be selfish, or that it will exact a toll from us that’s higher than we are willing to pay. All such countercurrents have to be dislodged. We can sense the existence of such currents if we feel tense and strained in our desires. If we are afraid of not obtaining the desired result, our psyche is holding onto a fear of the desired result. We’ve got to dig up such contradictions if we’re hoping to take a giant banana step in the direction of fulfillment. Well good golly, Miss Molly, why should anyone fear happiness? Sometimes it’s because we fear abandoning ourselves to it. Or that bliss will make us totally lose control. We might fear that a bunch of obligations will come with it that we don’t want. Or maybe we fear we’re inadequate to have it or keep it. Just because we want something doesn’t mean our unconscious doesn’t have its own completely different agenda. This idea that the self has a job to do in playing nicely in the sandbox with the universal creative powers, well, that’s not always as simple as it sounds. We have to look at how our desires are wanted, and what other soul movements are coming along for the ride. Two things have to be considered. First, where and why do we subtly say No to what we think we want. Because here’s the deal: if we want something and we don’t have it, somewhere we’re saying No. Second, we must be able to say it, loud and proud, in so many words, that this is what we want. See what happens when you do so. Feeling relaxed? Feeling like it’s possible? We can only ignore this line of questioning at our own peril—and the loss of having our rightful desires fulfilled. If we know the truth about what we want and are relaxed about it, without urgency, compulsion, tension or fear, then we can have it. This is well within the scheme of creation. This can relate to success in a career, health, an intimate relationship, good friends, or freedom from problems. If we’ve dissolved whatever hinders us, then it will be good and right for all concerned, and there’s nothing wrong or destructive about going for it. We need to poke holes in any stories about how we aren’t worth it or shouldn’t have our heart’s desire. This will sweep away false guilt that pushed us into depriving ourselves. We can then declare that what we want will benefit ourselves and others. We now want to visualize this. Being relaxed and determined is how we hold up our end of the bargain. This kind of commitment sets the creative powers into motion. The positive results that must come from this will justify that it was right to trust this creative process. That helps us trust our ability to perform our own role, letting the powers carry their part of the partnership. A positive benevolent circle of creation gets established this way. We are amazing creators. We are, in fact, creating all the time. The question is, are we doing it deliberately and consciously, calling on the universal forces to help clear obstacles and then to make the thing—whatever it is—grow. Or do we let the wheels of our unconscious go unchecked. The self-directing mind can get the ball of greater forces rolling, and they respond to the direction we set. They know exactly what to do to get the job done. But our job is to know all the pieces that are in play. Think of this interplay as being like a gardener who prepares the soil, but isn’t the one to make the plant grow. When we till up the dirt of our consciousness, it’s like preparing the soil. When we pull out wrong concepts it’s like yanking up weeds. When we get rid of obstacles it’s like removing rocks that would block the spread of the roots. Implanting truthful concepts is like planting the seeds. Cultivating the right attitude and having patience is like tending the soil till the sprout comes up, making sure it gets the water, light and nourishment it needs. In this way, the gardener does their job, making it all possible. 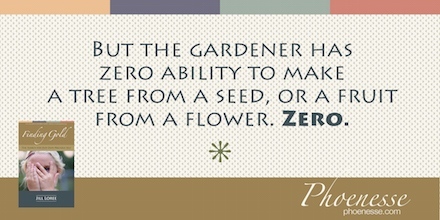 But the gardener has zero ability to make a tree from a seed, or a fruit from a flower. Zero. All the gardener can do is make sure to plant the proper seed. But they can’t make it grow. There isn’t a thing in the world the gardener can do to bring that about. But by cooperating with the creative process, fulfilling certain conditions in the right way, the gardener makes it possible for nature to do its job—so the soul can get fed. What doesn’t work is to plant the wrong seed. And so often, believe it or not, we plant the seed for the very opposite of what we want. This makes us distrust life. But if we can see how we brought forth just what was sown, even the negative results can give us confidence in the principles at work in this process. This creative process operates on every level. For example, in healing the body, if we cut ourselves, we need to wash the wound and apply a bandage. Then we let the healing process happen. On the mental level, if we plant the seed for something our innermost layers can’t quite accept, or where there have been countercurrents active for a long time, then a period of incubation will be needed. Underneath the surface, much is going on. A little quiet time is just what’s needed for growth. But what we so often do is despair and stop trusting, effectively tearing up a seed that’s barely sprouted. In perfect mutuality, the self and creative forces will strike a balance. The activity of the self—whose job is to fulfill the necessary conditions—will meet the passivity of the creative process. When we find this right balance, there won’t be any missing puzzle pieces in our lives. We’ll have harmony in our soul. We won’t become overactive, thinking we have to do it all. And we won’t become over-passive, giving our life to an external God who we hope will do the work for us. No, in proper balance we’ll be relaxed and stimulated in a harmonious way. We’ll prepare the soil just the way it needs to be done. Then we’ll have the humility to let go. We kick all this off by knowing the perfect possibility exists as pure potential. Just knowing this makes it possible for potential to become realized. This also opens doors to allow creative powers to push aside the walls within us—walls made of doubt and fear and ignorance. At some point, we can actually feel these walls fall away. First we’ll fear this happening. Then later, we’ll tentatively try it out. When we really experience it, we’ve got the key to selfhood. The mind will let loose of its grip and we will commit to living fully. Glory be. But first, the opposite is going to happen. The lazy little ego doesn’t like to be accountable, doing what must be done to get a good, desirable outcome, i.e. lead a meaningful life. So where activity should reign, passivity rules. Where it should let go, it’s incredibly busy, holding itself together in a tight knot. It’s going to take some work to get the ship in shape. When balance gets restored though, the fences will come down. The self will expand. Amazing potentials will be realized. This is a truth—not wishful thinking or evasion of the self. Let’s see how this might look in meditation. We begin by embracing a truthful concept in the outer mind. We allow No-currents and inner obstructions to surface. Gradually, the truth can spread to deeper layers. Then the whole psyche, like a beautiful flower, will unfold as in the rays of the sun. As each of the layers soaks up the truth, new vitality is ushered in. One can feel this happening in hours of deep recognition. Tightness lets go to the liberation and light that the infusion of truth carries in.